Which kind of beer would you give up drinking? I had a tap open on my kegerator, so I "had" to brew something quickly, so I came up with a recipe based on what I had on hand. Bitters are some of the fastest and easiest beers to make due to their low gravity and simple recipes, and since I hadn't brewed one in awhile it seemed like the perfect choice. I also wanted to get a big yeast cake for a Munich Porter and a Sour Mashed Old Ale that I've had on my brewing schedule for a while. What I got was a great, malty, balanced English ale that I was able to put on tap just 10 days after I brewed it. This was my first time using Wyeast's London ESB - 1968. I was impressed not only by how quickly it completed fermented but also by the speed it dropped bright. I brewed on a Tuesday and by the following Sunday the beer was at its terminal gravity and crystal clear (and the following Friday I was drinking it). Luckily the flavor of the beer turned out to be just as impressive. Finally in this strain I've found an English yeast that I'm really happy with both for how it behaves and the beer it makes, hopefully the Munich malt based porter it is working on now won't let me down. I went with a simple malt bill: mostly Maris Otter, with a bit of medium English crystal malt for sweetness/caramel, and some amber malt for that bready/toasty maltiness. The hops were all whole Goldings from Freshops. They are American grown, but they still provided a combination of herbal/earthy/fruity character that is a classic component of many English ales. I spaced the hop additions over the course of the boil to ensure a saturated hop contribution that isn't too heavy on the aroma so the malt and yeast will be able to make their presence known. I think session ale recipes should be pretty simple, if you want something to be drinkable don't muddle it up with more than a handful of ingredients, and make sure the ingredients you do select are all high quality and flavorful. I did an all-day (~7 hour) mash while I was at work (which boosted my efficiency making this bitter Extra Special). A long mash is a nice way to shave some time off of a weeknight (or early morning) brew, but make sure to either do a mash-out or use very hot sparge water (180+) since your mash temp will most likely dip down 10-15 degrees. Despite better than expected extraction the beer still only ended up at 5% ABV. I decided to keg condition it with 2 oz of priming sugar both for authenticity's sake and because this beer only had 5 days in primary before I needed the yeast cake. I thought it would benefit from some extra time for the yeast to continue cleaning up before it was chilled down to 45 degrees for serving. 1.00 oz. US Goldings (Whole 4.15% AA) 48 min. 1.00 oz. US Goldings (Whole 4.15% AA) 24 min. 1.00 oz. US Goldings (Whole 4.15% AA) 12 min. 1.00 oz. US Goldings (Whole 4.15% AA) 6 min. 0.13 oz. US Goldings (Whole 4.15% AA) 0 min. 0.50 tsp Yeast Nutrient @ 9 min. 1.00 tsp Irish Moss @ 9 min. Made a starter 3/15/10 with 2.5 oz of light DME, 1 qrt of water, and 1/4 tsp of yeast nutrient. Good activity by the next morning. Brewed 3/16/10 started mash before I left for work. Really hot sparge 180-185 to get the grain temp back up from ~138. Collected ~6.75 gallons of runnings. Added 6 g of gypsum to the kettle during the sparge to up the sulfate content to ~200 ppm. Boil was a bit weak for the first 30 min, so I switched to a different propane tank to finish out the boil. Used whole Goldings from Freshops, adjusted AA% down from 4.5%. 1 tsp of Irish Moss, rehydrated, along with the Wyeast yeast nutrient. Chilled to ~69. Pitched the already flocculating starter. Shook to aerate. Placed in the basement ~62 degrees. Good fermentation after 12 hours. Fast start to fermentation, but the krausen never got more than a couple inches thick. 3/21/10 Gravity down to 1.015 (72% AA). Racked to a keg and added 2 oz of cane sugar. 3/27/10 Moved to the kegerator, and tapped. Good carbonation, nice head, great malty flavor. The amber malt "biscuit" flavor really comes through nicely. 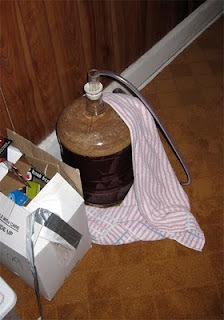 5/04/10 First tasting, nice malt/hop characters, but it has an odd cocoa finish that must be from the Amber malt. I've been trying to figure out your post boil - pre-ferment process from the photos. I am guessing you strain the wort into the bottling bucket, let it settle then rack into the fermenter. 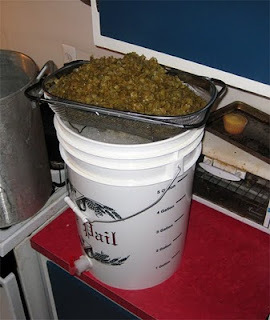 I usually strain straight into the fermenter (sometimes with some fresh hops to make a crude hopback). Is the idea to let trub settle before fermentation? Any other reasons or am I completely reading the photos wrong? I chill in the pot with an IC before pouring the beer through the strainer. I don't even really let the wort settle, I just strain out the hops so they won't clog my racking cane when I go to move the beer out of the fermenter. I would strain right into the fermenter if I fermented in buckets, but with carboys it is easier to strain first. Bitters are some of my favorite beers on the planet. Nothing like a rich, flavorful beer, that you can drink 6 of and still not really be drunk. I like your recipe. Sounds a bit hoppy for style, but that's how I like them. Have you had firestone walker DBA (or tried the can you brew it recipe)? It's a 5% bitter, with way too much flavor and aroma hops, oak aged in wine barrels (but not sour). It's a fantastic beer and I think it might be up your alley. I was actually trying to make a pretty hoppy beer, but with the higher than expected OG it actually ended up pretty balanced. The highish FG (1.015) also makes for a beer that doesn't come across as especially bitter. I've never tried the London ESB yeast from Wyeast, but your description of it has got me intrigued. Do you know how 1968 compares against, say WLP002? According to: http://www.mrmalty.com/yeast.htm 002 and 1968 are the same strain (both are from Fullers anyway). Never used 002, so I can't compare how they actually perform. uh...wait...you have a 7 hour workday, including commutes on both ends? very nice, Mike. aside from that, I think the all day mash is a really great option for those looking at work week fragmented brew schedule, and those seeking a very fermentable wort for a high (~1.100+) gravity beers, ie. an IIPA, RIS, etc. Easy 20 min commute, and I have a flexible work schedule, I just need to make my hours every pay period. Although I do have to let my boss know if I won't be in from 9:30 am - 3:00 pm. looks good. I'm brewing up something very similar in a few days only with about a half pound of No.2 sugar added. I know you read or are at least pretty aware of Ron Pattinson's blog. 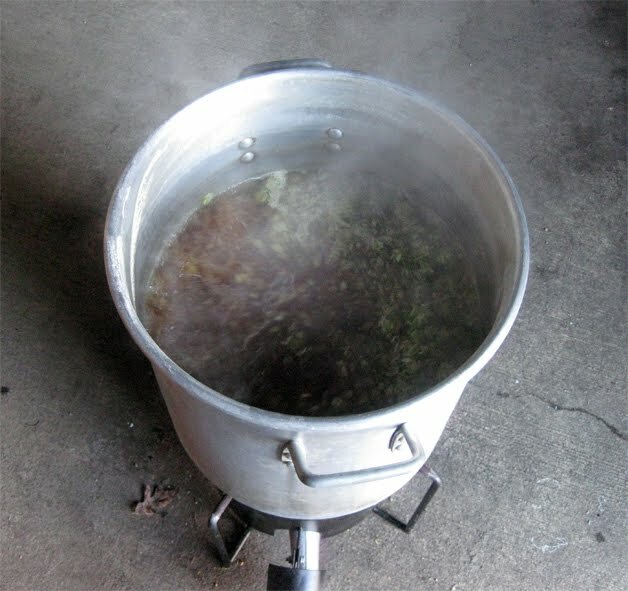 Have you done any of the lower gravity bitters or milds that call for the brewing syrups? If so I'm curious of how it worked out? I used lyle's golden syrup in one of the sugar experiments, with alright results. Never really understood sugars in low gravity beers, the last thing I want is to thin them out. That said it is very popular in England so there must be something to it. There is something to using sugars in low gravity beers.... MONEY! Same reason all the american macros use 6-row and adjuncts. If you're truely trying repilicate some of those beers you can use sugar, but I don't think it'll add to the flavor. They also mash somewhat higher to compensate for the decreased body from the sugar use. Just made this is as a transitionary beer since I'm all wheated out. Absolutely fantastic! Definitely going to be a staple from here on out. Thank you!